When I lived in Paris, eating pastries was a special indulgence that I don't normally do in the U.S., so I definitely took full advantage and may or may not have eaten a pastry almost everyday! One of my favorite treats in Paris was "les choux á la créme" or cream puffs (using the plural because you can't eat just one puff)! If you're like most tourists, you automatically think "macarons" when you think about the quintessential dessert in Paris, but we need to take a few minutes to chat about these delicious puffs filled with flavored cream! I visited Odette a few times (I won't tell you how many!) while living in Paris and loved taking friends and visitors to the quaint French pastry shop to introduce them to the choux! 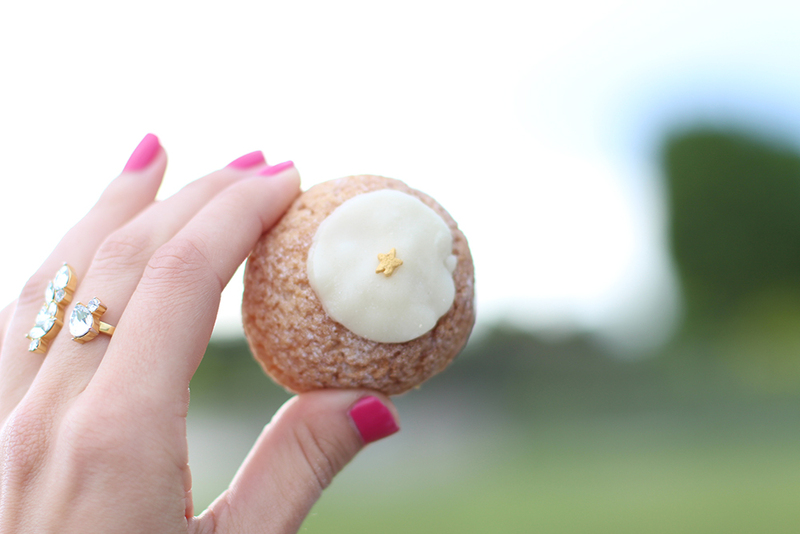 Choux actually means cabbage in French, but also means cream puff- French is so confusing! My boyfriend Stephen came to visit and we celebrated our one year anniversary while he was in Paris with me. It was his first time to visit my favorite city, so of course I had to show him around Paris and take him to all the cute shops and tasty bakeries, including Odette! Just down a quiet street from Notre Dame, Odette is tucked into the tiniest corner (like everything in Paris!) and has a small 2nd floor tea room where you can sit and look out the window with a view of Notre Dame. If you're just looking for an afternoon break, definitely order a coffee or tea with your choux and get a table out front (aka on the sidewalk) where you can watch Frenchies and tourists stroll down the street. At 1.90 euros per choux, they're not cheap, but they're also not as expensive as many macaron shops - I'll take it! As with any place in Paris, I would advise checking the hours before you plan your visit...sometimes shops are closed on an odd day or have extended lunch hours, so plan ahead! Stephen and I took our time ordering in a laughable mix of French + English and selected 6 puffs to enjoy on a picnic; we ended up with (L to R in the box photo above): 2 caramel, vanille, citron (lemon), chocolat, and fruits des bois (mixed berry) - we both love caramel so we didn't want to share that one! 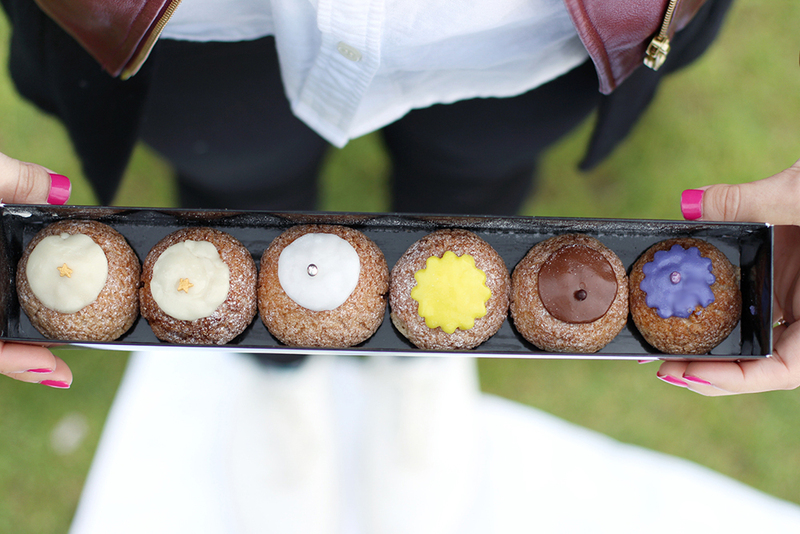 They were all SO good and you really can't go wrong with any of the choux flavors. Odette usually has a mix of traditional and seasonal flavors, so depending on the time of year you visit, you may be able to try something different! Some other flavors available were pistachio, green tea, and coffee, which also looked tasty! 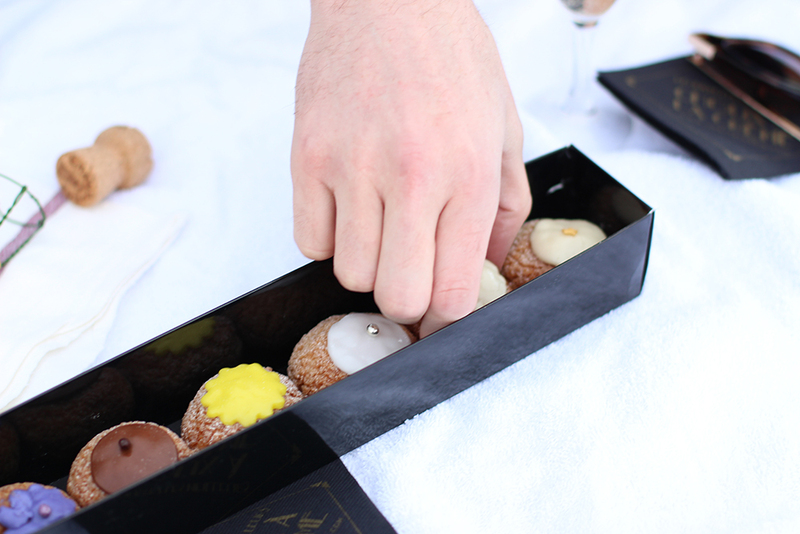 After we bought our cream puffs, we gathered our picnic supplies from my apartment and picked a spot on the lawn in front of the Louvre to enjoy our choux! One of my favorite things about my time in Paris was being able to sit down in the grass in front of beautiful monuments and historic buildings just to relax, read a book, or enjoy a dessert picnic! I was so pleased that Stephen liked the puffs as much as I did (he's not a huge fan of macarons, so I wanted him to enjoy these!) and we ate all of them. ALL of them. Unlike American pastries or sweets, if you eat 3 Odette choux in Paris, for example, you won't feel sick to your stomach because they bake so differently in France, so eat up! ;) If you're planning a visit to Paris, definitely watch this video by Odette because it will put you in the French mood right away. Odette shouldn't be missed - I hope you enjoy it as much as I did! Bon appétit!